Lately, it seems like almost every week Facebook is coming out with a new feature, test, beta or interface change. So, it would take something special to excite you, right? Well, finally, the long-awaited creative split testing is here! 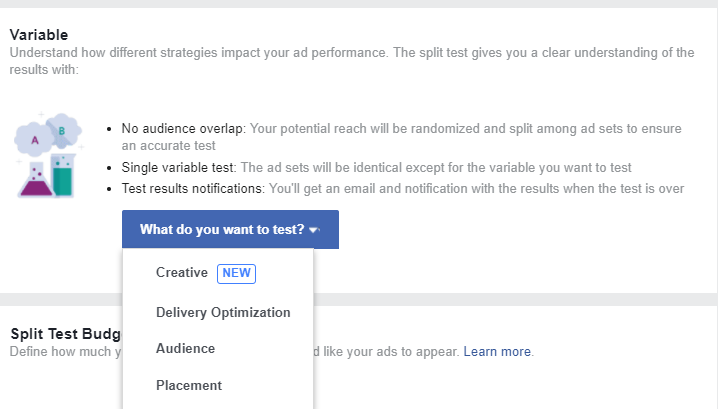 Up until now, Facebook enabled you to split test audience, placement and delivery optimization. While these options provide some great A/B testing capabilities, the inability to split test creatives made these features seem incomplete. Although this feature is not yet available for all accounts, it allows for some awesome possibilities that were up until now only available via external tools. What are the creative elements that you can test? 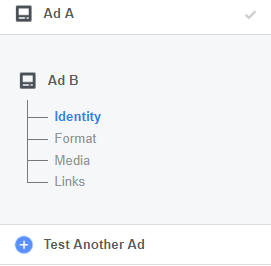 The new feature allows you to test identity (your Facebook page and Instagram account), format (carousel, banner, video) and links (which contain all other elements including headline, text, description, destination URL, CTA button and more). Media is the actual image or video. 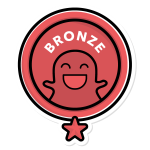 As you can see in the image above, it does not have to be an A/B test – you can add up to 3 more variations and make it an A/B/C/D/E test! We cannot stress this enough – Facebook has significantly upgraded its testing capabilities. Finally, you can A/B test landing pages via Facebook. In a visual world, see how much good ad copy still matters. Included in the testing of any two videos, banners, or carousels against each other is the capability to see how sound affects your video performance. As you can see, Facebook has really stepped up its testing game! So, you really have no excuses now – it’s time to roll up your sleeves and gain some valuable insights. Keep in mind that split testing will not solve everything and you should also understand the basic principles of engaging creatives and visual marketing. Read this post from our creative team to understand why your Facebook ad may not be delivering. Still need some help? Our team of professionals would be happy to assist.